Frankie says I'm just going to stay out of it. Devin says you've been in it all week! Big Brother Spoilers > Big Brother > Big Brother 16 > Frankie says I’m just going to stay out of it. Devin says you’ve been in it all week! Frankie says I’m just going to stay out of it. Devin says you’ve been in it all week! In the bathroom Amber, Victoira and Nicole are getting ready. Out in the backyard Devin starts doing laps back and forth. Christine gets up on the elliptical. 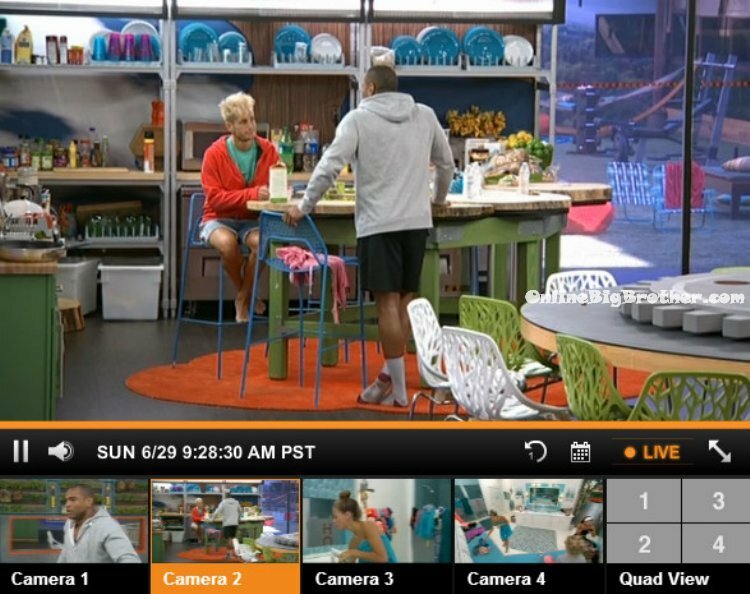 9:45am Frankie goes to the bathroom and says that he is going to just remove himself from the drama. The girls (Amber, Nicole and Victoria) ask if there was more last night? Frankie says yeah with Devin and Brittany. Frankie says I just always try and help people and I need to stay out of it. Victoria asks why Brittany? Frankie says I guess she wants to go down with the ship. 10am Frankie heads out to the backyard. He sits on the backyard couch with Christine and they laugh about how Brittany is self-destructing in the house. Christine says I can’t wait for Julie to ask her what she was thinking. (About her confrontation with Devin) Frankie pretends he’s Brittany and says I thought it was best to be honest. Frankie and Christine laugh. Frankie says and Brittany always says the hot words. I said it once and then stopped myself and apologized but she keeps doing it. And she keeps talking in the same accent that other people got in trouble for. Frankie tells Christine well that’s my update for the day. I’m just going to stay out of it. Frankie heads to the kitchen. Big Brother blocks the live feeds and when they come back the girls talk about how Big Brother said the Veto Ceremony is happening this morning. 10am – 10:25am In the kitchen Devin talks to Caleb. Devin asks what happened last night. Caleb says that Brittany came to me and asked if she should talk to you because she felt bad. Devin says that she was just bringing up things like the lotion and the sheets. He says that she got frustrated and said she couldn’t talk to him any more. Devin says I don’t got time for that, you know. Frankie comes into the kitchen and Devin tells him that he should be neutralizing the problem. I think you should say you don’t think there’s a problem instead of making it more hostile. Frankie says yeah that’s great advice thank you. Frankie says I think I am just going to stay out of it. Devin says you’ve been in it all week Frankie! Frankie says I just need to stay out of it. I’m getting dragged into it and thrown under the bus apparently and you’re confirming it. Devin says we just need to be careful because if she wins HOH she is going to start throwing people up. Frankie says I don’t think that’s going to happen. Frankie says I am just going to smile nod and keep my distance. Caleb heads up to the HOH room where Frankie is getting ready. Caleb says that it’s going down soon, I need to start talking to people. Cabel then asks Frankie if he can start doing that too. Frankie asks Brittany? Cabel says no everyone. Frankie says that he is trying to .. Yeah I’ll do it. Frankie says I wish we could just backdoor Brittany and then Devin wouldn’t have any supporters. Frankie says but we can’t do that because she’s safe this week. Caleb says that he will say that at first he was just going to go with the house on this but in the last few days you (Joey) have just been a loose cannon. Frankie says you can say that you’ve created the most upset in the house and this will create the most harmony. Frankie says no one in the house would say to put up Devin after yesterday. Caleb says except Brittany. Frankie says yeah except her. Caleb says Joey this isn’t personal. Frankie says you dug this for yourself. 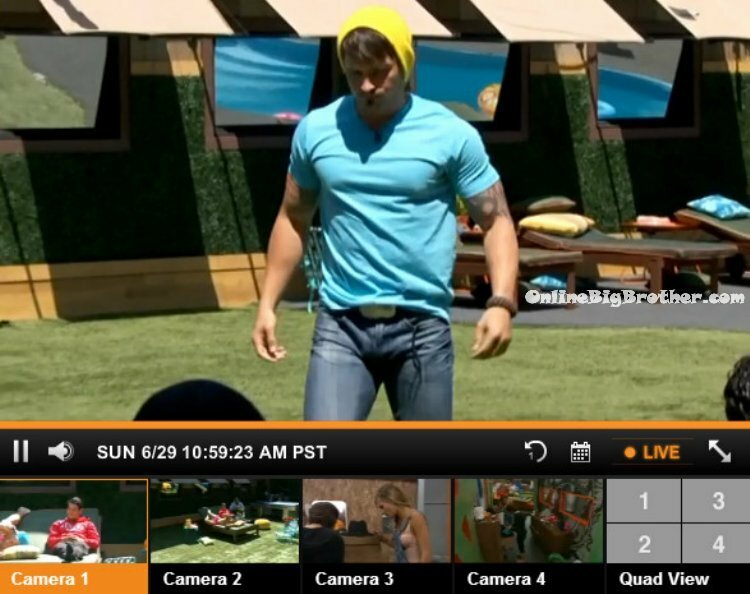 Caleb says you’ve created the most upset in the house and the consensus was to put you up. Frankie and Caleb talk about what Caleb should wear. Frankie says look like you’re HOH. Caleb says look like I run the house? 10:35am – 10:40am In the kitchen Devin complains that he poured the syrup on his pancakes and ants came pouring out of it. “That’s so gross dude!” Out in the backyard – Caleb comes down and asks to talk to Donny. Caleb asks what his preference would be to nominate as the replacement. Donny says well I am going to use it. But as far ask who you should put up, I don’t have a preference. Caleb says okay and heads inside. Caleb goes to the havenot room and wakes up Cody. He tells him that Big Brother called him 5 times to change his batteries. Caleb goes up to Victoria and asks her who she wants as the replacement. Victoria says she doesn’t know. Caleb says at this point I want to do what the house wants and what’s best for the house. Victoria asks Caleb who he is thinking. Caleb says there is someone that the majority of the house wants out. Victoria asks blue? Caleb says oh hair, yes. 10:55am Frankie and Devin head out the backyard. Devin says that its hard being in this house. Frankie says he knows. He says that he just can’t be throwing himself in the middle of things and protecting people especially with her (Brittany). Devin says no I know, I don’t need anyone to protect me. When I get quiet I am just playing chess in my head. Frankie says I meditated on you upstairs. Devin asks is that code for anything? Frankie says no. Devin says okay thank you. Frankie says we just don’t want to expose us. Devin says you know I love you. Frankie says I love you too. Devin says after this veto, I am going to start distancing myself and start thinking about my chess moves. Next HOH Britanny and Paola gotta win. OK here we go. Now please correct me if I am wrong. Caleb is this weeks sole HoH since Victoria and Brittany won battle of the block. Frankie is no longer an HoH. So Caleb has to nominate two more people. Plus with Donny winning PoV he will taking himself off the block… correct? So that is three nominations for Caleb. So why not look like he is going with the house and nominate Devin and Joey both also throw in someone that has been a bit wah wah like Jocasta. My personally I might keep Joey and get rid of Devin or maybe Poala or Jocasta… actually Jocasta. I have nothing against her it is just that first week is usually the no harm no fowl week… and a person who hasn’t connected with the other houseguest’s go’s or in recent years an athletic guy like Devin.. I am all for the geeks dumping the muscle…. but crazy like Joey can take herself out on her own. Frankie my friend chill a bit, because it may not look like it yet but you are cruising for a week three eviction. Both “co-HOH” had to nominate first. Then, their nominees fought in the Battle of the Block. After that, Caleb was the sole HOH, and his 2 original nominations became the sole nominations (Donny and Paola). He only gets to nominate 1 more because of the POV being used. Devin is putting a huge target on his back. He is one of my early dislikes. 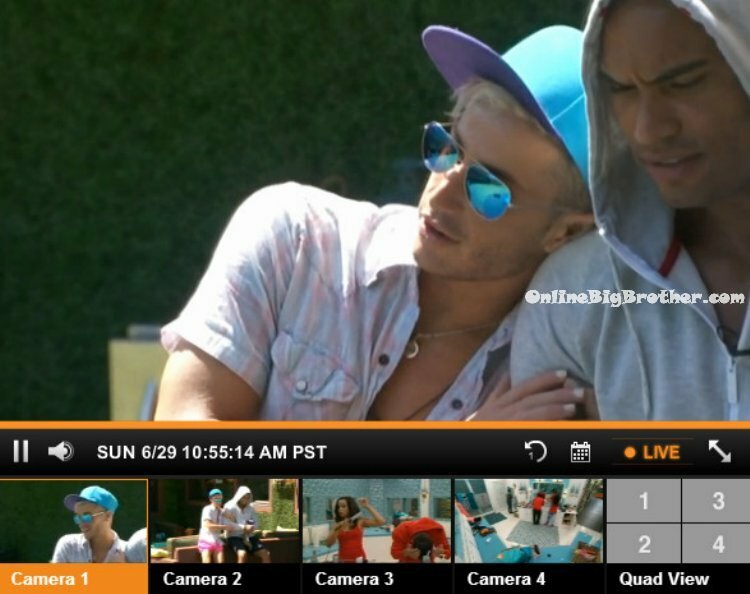 Frankie is starting to be freaked out that Devin will go off and Frankie might get hit by the shrapnel. Too bad veto is today. One more day and Devin might have earned a place on the block. Not that I want Joey to stay, she annoys me, but at least she isn’t a non entity like Victoria and Jameka 2 have been so far. It’s so hard for me to watch the feeds during the first few weeks!! A lot of he said she said && alliance forming that won’t last a week && makes it so confusing to keep up with! So Simon && Dawg THANK YOU for making it much easier! I’m sorry but I cannot stand Caleb!!! Feeling bad for Joey but week one HOH doesn’t need have to be a rational reason for putting her on the block. She has no secure alliance, can’t play a “I’m not a threat” card and her name has already been dragged in the mud so won’t be baffled seeing she goes home week one. Overall players this year seem pretty in tune and are setting their foundation. Hopefully next HOH alliances might be shaken up if 2 people like Hayden and Nicolewins. I had a question about this years twist. Since Brittany and Victoria won the Battle of the Block competition, are they safe from being the replacement nominee when Donny takes himself off or can Caleb still put one of them up if he wanted? I know Joey is most likely going up on the block but I was just wondering. Thanks!! I believe they’re safe from being nominated as a replacement. However, Frankie is not safe. Frankie is starting to act like Helen. He has alliances with everyone. That gets very hard to juggle later. Good first week- I don’t hate anybody yet. Last season, I already hated Jeremy. Eventually, I couldn’t stand any of them, except Jessie.